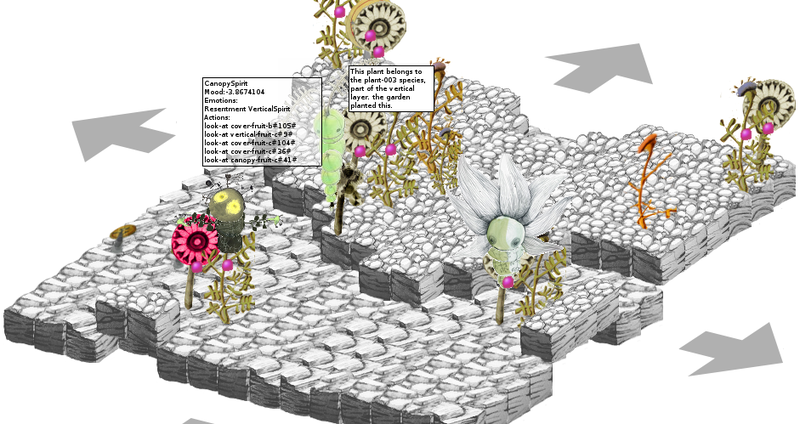 Two new plant spirit types, and they can now move and animate, driven by the fatima agent. They travel around the world tiles based on player activity and hover over or around the object causing them the highest emotional reaction. There is a basic attempt to show their emotional state via their animation – smooth sinusoidal movement is caused by love and admiration, the rate of this movement is controlled by joy and gratitute. Jittery irritable movement is caused by distress and hate. Click on the spirit’s heads to toggle the FAtiMA debug information. Go to the game! The fruits of “type 002” plants sometimes grow back (more like re-spawn) as soon as I harvest and plant them. Is that right? I planted a few little forests of those… and now the carrot-shaped spirit is ashamed and has remorse. I’d feel bad about that if the spirit didn’t express those things in such a cute way. Hi Kassen, yes the fruits currently respawn as fast as you can pick them if the plant is at that stage. Lots more work to be done in this, such as recording who picked fruit from each plant, and making some connection with the person who originally planted them. This should all go to provide the spirits with more detail to react to based on these connections.